Are you buried by a paper mountain and ready to create a lasting system for the paperwork and to-do’s that clutter your kitchen counter tops and your mind? The Sunday Basket is the solution for you! Sunday Basket Workshop is where you will actually start your Sunday Basket. We have partnered with Organize 365 and bring you a hands-on paper organizing workshop so you can immediately implement a proven system as soon as you get home. The Sunday Basket is a system for processing mail, kitchen counter "to do" paperwork, random notes, schedules, and ongoing household projects. The weekly routine of processing, and maintaining household to do's and papers is the perfect training ground for all your future home organizing skills. 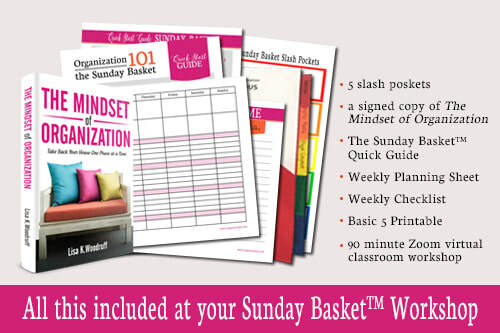 For more information about the Sunday Basket with Organize 365, start here! Take the Sunday Basket 1.0 & 2.0 Together! 79 Chicago Street, Valparaiso, IN. The second Friday of each month. There are no refunds once you register for your class so check your calendar to make sure the date and time work before you register.